Now this one is a Vue render i had on my HD for a while now. Pretty much like my previous Comcept painting. A few days ago i took me a few hours to mess around with it and unleashed a tour of filters on it. As well as textures and adjustment layers and stuff stuff stuff. Quick and dirty. Result ends in a, from my point of view, nice Blade Runner’ish setup. 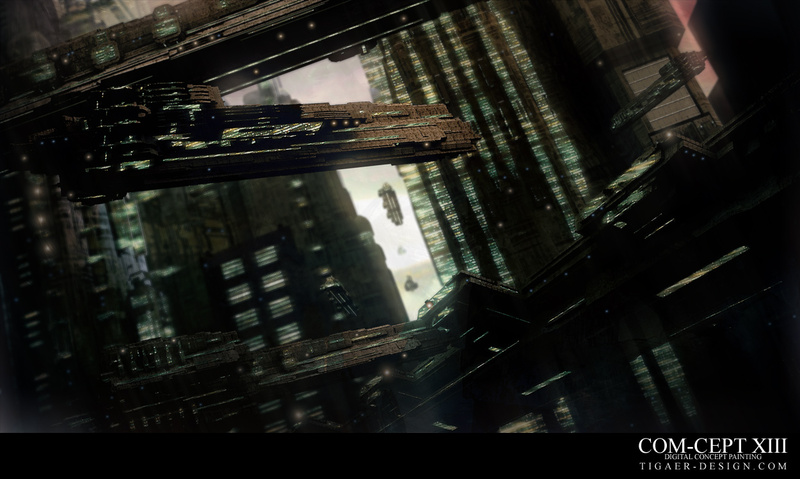 Basically what i wanted to portrait was a kind of docking station within a huge futuristic city. Now the ships we see have a crew of probably 200-300 people. So the dimensions here are pretty huge. Just the way i like it. All i wanted was to transfer an idea and i hope i do here. Hope you like the vision and style. This entry was posted on Thursday, September 3rd, 2009 at 00:45	and is filed under Paintings. You can follow any responses to this entry through the RSS 2.0 feed. You can leave a response, or trackback from your own site.